Rachael has parlayed that birthright into a wildly successful career as a syndicated television star, an iconic Food Network television personality, bestselling cookbook author, Founder and Editorial Director of her own lifestyle magazine and Founder of the Yum-o! organization. Rachael’s hugely successful syndicated daytime program, Rachael Ray, launched in the fall of 2006. Showcasing Rachael’s warmth, energy and boundless curiosity, the show—produced by CBS Television Distribution and Oprah Winfrey’s Harpo Productions—invites viewers to experience life the Rachael Ray way. Credited with getting America back in the kitchen with her easy approach to cooking, Rachael takes the same philosophy—finding simple solutions to everyday problems—beyond the kitchen and into all aspects of the show. Growing up in a family steeped in culinary tradition, Rachael was exposed to a wide range of cooking techniques, from her maternal grandfather who grew and cooked everything his family of 12 ate, to her dad’s family, which embraced the food-rich traditions of Louisiana. The Ray family owned several restaurants on Cape Cod, Mass., before relocating to upstate New York, where her mother worked as the food supervisor for a restaurant chain. “I was surrounded by all different styles of cooking and worked in the food service industry in just about every capacity you can imagine,” Rachael says. Despite the exciting lifestyle in the foodie circles of New York City, Rachael decided to move back to upstate New York and start managing pubs and restaurants at the famed Sagamore Resort on Lake George. From there, she was recruited by Cowan & Lobel, a large gourmet market in Albany, to be their food buyer and eventually their “chef.” As a way to increase grocery sales during the holidays, Rachael created a series of cooking classes, including a course promising to teach 30-Minute Mediterranean Meals, which exploded in popularity. The CBS station in Albany-Schenectady, WRGBTV, discovered Rachael and signed her on to do a weekly 30-Minute Meals segment for the evening news. Nominated for two regional Emmys in its first year, the segment was a major success; a companion cookbook sold 10,000 copies locally during the holidays. With that, a franchise was born! Rachael’s television work grew to include a series of lifestyle and travel segments as well as a long-term relationship with the Food Network, hosting shows such as Rachael’s Vacations, Tasty Travels, $40 A Day, Inside Dish and 30-Minute Meals, the latter of which earned Rachael a 2006 Daytime Emmy Award for Outstanding Service Show and a nomination for Outstanding Service Show Host. In addition to her television endeavors, Rachael has turned her 30-Minute Meals concept into a bestselling series of cookbooks, including “30-Minute Meals,” “30-Minute Meals 2,” “30-Minute Meals: Get Togethers,” “Comfort Foods,” “Veggie Meals,” “The Open House Cookbook,” “Cooking Round The Clock Rachael Ray 30-Minute Meals,” “Cooking Rocks! Rachael Ray 30-Minute Meals for Kids,” “Rachael Ray Best Eats In Town On $40 A Day,” “Rachael Ray 30-Minute Get Real Meals,” “Rachael Ray 365: No Repeats A Year of Deliciously Different Dinners,” “Express Lane Meals,” “2-4-6-8: Great Meals for Couples or Crowds,” “Just in Time: All-New 30-Minute Meals, plus Super-Fast 15-Minute Meals and Slow It Down 60-Minute Meals, “Yum-o! The Family Cookbook,” and “Rachael Ray’s Big Orange Book.” Rachael’s seven most recent titles all were New York Times bestsellers. Taking the can-do spirit of her television shows and books, Rachael launched a new lifestyle magazine in 2005 bearing her vision called Every Day with Rachael Ray. With great food at its heart, the new full-size glossy magazine, for which Rachael serves as editor-in-chief, covers much more than food. The magazine offers smart and easy recipes for an array of delicious foods, as well as practical advice on food destinations and entertaining. Through the magazine, Rachael takes readers around the country to meet people who love food—from top celebrities and authentic artisans to great home cooks. 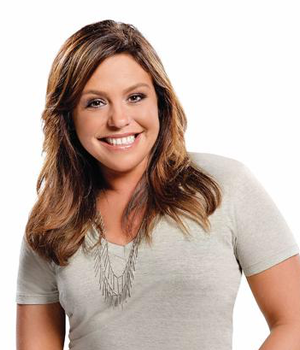 In 2006, Every Day with Rachael Ray was named Launch of the Year by Advertising Age, won AdWeek’s Hot List in 2007 for “Start Up of the Year,” and was named to Advertising Age’s “A-List” in 2008. Last season, Rachael Ray won the 2008 Outstanding Talk Show—Entertainment Emmy Award. Adding to the list of achievements, Television Week named her Syndication Personality of the Year in 2007 and BusinessWeek honored her as one of the Best Leaders of 2006. In its freshman year, Rachael Ray won a 2007 Daytime Emmy Award and was nominated for six others including Outstanding Talk Show and Outstanding Talk Show Host. “My life has been a total accident—a very happy, wonderful accident that I didn’t and couldn’t have planned,” says Rachael. Despite her growing celebrity she is determined to stay grounded and hold on to her down-to-earth values. She still spends as much time as she can at her cabin in the Adirondacks with her husband, John, her family—the “research team”— and her beloved pit bull, Isaboo. Many say that Rachael, host of four shows on Food Network, author of 11 successful cookbooks,daytime talk show host and Editor- in-Chief of a self-titled magazine, is everywhere. The Brooks Group, who handled Rachael’s publicity for more than 3 years, began working with her in 2003 with the goal of bringing Rachael from Food Network star to household name. Tenacious and targeted pitching led to media coverage in national magazines and newspapers as well as radio and television features. Memorable placements include a cover story in The New York Times Dining section, a multi-page feature in People, a cover story in American Profile, USA Today, Associated Press and several appearances on The Today Show, Late Show With David Letterman, Good Morning America, The Oprah Winfrey Show, Live With Regis & Kelly, and The View, among others. The Brooks Group, who accompanied Rachael on her national book tours, garnered publicity that showcased not only her expertise in quick cooking and time-saving tips, but also her knowledge about lifestyle topics such as travel, entertaining, style, décor and more. Leveraging the firm’s solid relationships in beauty, Rachael has appeared in magazines like Glamour, Redbook, O The Oprah Magazine, Woman’s Day and Elle. Rebecca and her team get the job done: When I thumb through magazines at the hairdresser and doctors office, I get scared because I see myself “everywhere”. I would have to say my PR is too good — I even get stopped in toilets! The agency is filled with people you actually want to talk to and get calls from. I think that’s the advantage — there are no caricature “PR Vipers” at Brooks Group. Rebecca has become so much a part of the family, she came to my wedding — in Italy, where “family” means family!